I don’t watch Downton, though daughter and daughter in law love it. I do like historical fiction though, especially that set in UK involving the big, country house lifestyle. 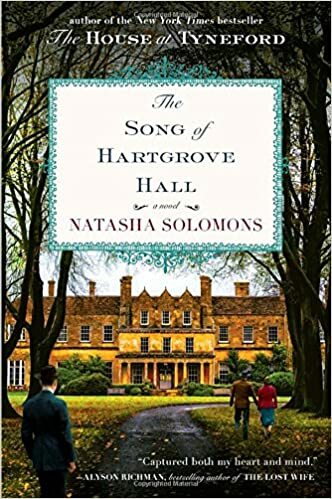 this isn’t quite what I expected though, Hartgrove is on the verge of destruction, regained back from the ministry after the war and in a bad state. The farmland is poor too and there’s little money coming in, the valuables paintings etc having been sold off for upkeep long ago. There’s only the General, an elderly servant who does a bit of everything and a few daily girls in to do the housework. The three brothers though love their home and hatch a plan to save it. The book is told in past and present by Fox, the youngest son. I found it really hard going to begin, it not being as I expected and jumping from past to present and back, but at about 20% in I finally got hooked. Though I liked the angle of the present and the relationship between Fox and grandson Robin I really needed to find out about Edie and the brothers in the past, so just after the halfway mark when I just couldn’t wait any more I sneaked forward, skipping the present and just reading the past. I did catch up with the present part later….so not too naughty! When we’re in the past and we first meet Edie she’s with Jack, though its clear youngest brother Fox who’s far younger than her, has fallen in deeply in love with her. When we’re in the present we know Edie was with Fox and they had two children, and I just needed to know how that transition happened. Its a fabulous book once you get into it. I think if I’d not got the Downton expectation in my head I’d have enjoyed it sooner, but I was kind of waiting for something so that the derelict old house became a thriving country home and it wasn’t happening. Once I accepted that and concentrated on what was in the story I get on far better. Its told in an almost poetical way, with some fabulous rich language making use of English at its best. Its got a very strong musical thread running through, and though I’m no musician I loved it. I loved Marcus and the way he and Fox met, and he sort of amassed a group of musicians that just followed him round, some great characters. The time they’re all in Scotland much to the dismay of most of the local, God fearing population was very real. I did feel for Sal, clearly in love with Fox, but you can’t make someone love you back and it was clear that Fox was in love with Edie. The triangle of Edie, Jack and Fox was always going to end badly, there wasn’t a way out that would be easy, someone was going to get hurt, they always do in a love triangle. Yet it all kind of glosses along, and what happens seems inevitable. Usually I say its a choice, no one has to cheat but I do sympathise with everyone here – its not easy for any of them. Then there’s the current scenes where Fox is older, Edie has died and their two girls are adults. He has two granddaughters and grandson Robin, who is the musical child. Its always an issue how to handle a child with such extreme talent, and of course that affects the whole family. Nurturing it takes time and money and sometimes the other children resent that, and of course parents have to build their lives around the child’s schedule which can be gruelling for them all. Robin just wants to make music, all day and probably all night of he had the choice, but he’s only four when it starts. Its a conundrum between doing what’s best to help his talent, and doing what he also needs as a young child. There’s no going back and retrying if you get it wrong, and we’ve seen some real tragedies in child stars of the past. When there’s money to be made out of a child’s talent it brings out the worst in so many people, and of course the family bear the brunt of their choices. Robins parents and Fox don’t agree at all on the best thing for him but who’s right? Its a wonderful book, one to savour and appreciate the legacy of a forgotten time, and one where the issues raised really made me think about the choices we make and the effects they have on others. I don’t think it’ll be one I re read, but its one I’m really glad I persisted with after that slow start. Stars: Five, a great read to savour slowly. .